On a whim, I bought a shelf-bra tank top (in navy blue) from Target ($14.99). I don't wear tanks very often (I believe I have BDD for my arms... only half-joking! 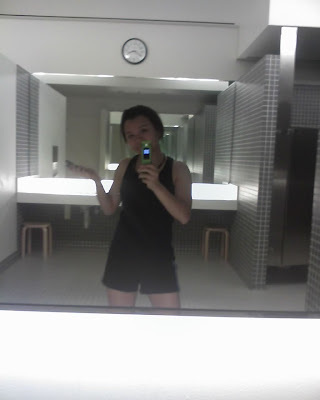 ), but in this heat, I am willing to go sleeveless so I won't die of suffocation in the gym. I liked it because it made me look athletic... it fits pretty well and has a nice racerback. 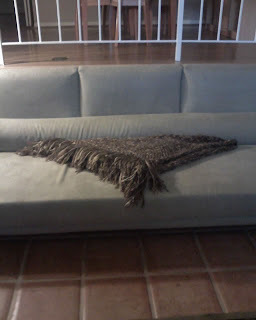 It is not made of technical fabric, but it isn't too bad with trapping heat, anyway. To improve its look, I should probably wear this with a sports bra underneath, though. Additionally, my Nike visor has been starting to fall apart over the past few months, and because I want to protect my scalp from the sun in a way that visors cannot, I got this Adidas Clima365 cap from Big 5 ($17.99) in white. This cap claims to have an SPF 25 finishing, vents, and is really a light cap. Best of all, it fits on what I believe is my huge head. 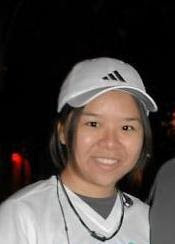 Above: My hat's debut at the San Francisco Half-Marathon last month. Okay, that's my brief "new gear" update. I will be on a slight blogging hiatus this week, as my comprehensive exam is this Thursday and Friday. Hopefully I pass so I don't have to retake sections next semester, but regardless, I'll be glad to be free of this beast for a while. I'm going to Hollywood Bowl next weekend to celebrate (though being uncultured as I am, this isn't exactly my idea of a celebration, but oh well). Yep, that is it. The pain I've had in my hip flexor for two months is now residual, but the pain of having lungs that are out of shape is comparable. Additionally, the hot weather (105 degrees yesterday! ), lack of life stability, and the ever-present burden of comprehensive exams (which I will be done with pretty much exactly one week from now) have killed any motivation to run. I'm not going to worry about it too much yet. I'm still working out and such, just choosing other activities over running. 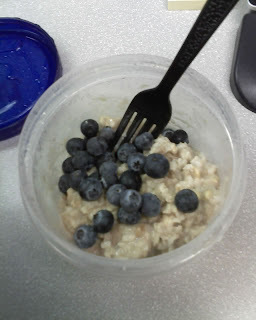 I'm eating relatively well in an effort to build my immunity to protect myself against current and potential ailments. Will I even get a regular flu shot? I've been getting them for the past three years, yet I've never had a flu in my life. I doubt there will be a new, experimental anti-H1N1 serum entering my system unless I see a definite need for one. So yeah, I am going back to basics when it comes to running, not so much focusing on getting faster (it was a secret hope of mine). The obsession with improvement, time, and comparing myself to others has really just taken all the fun out of running and races. Well, no more (at least... I will TRY). My first day of school is on Monday. I'll be what they call a "G3" (I was a G2 last year and a G1 the year before... get the pattern?). It's been a pretty good summer in spite of weirdness with work (at which I spent too much time). My goals for the school year are obvious -- pass comprehensive exam, start field hours, get cooking on my dissertation (I don't plan on being anything beyond a "G4" when all is said and done). Fortunately, I only have two classes this semester, and as far as those go, I don't care how I do as long as I pass them at this point! P.S. Yay for The Weekend! I'm planning on going to Chinatown and Little Tokyo with "The Ukrainian," though if you never see me post again, it's because I've died from the heat. 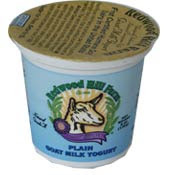 Last night, I was picking up some things at the health food store near me (Sprouts) and noticed some goat milk yogurt next to the Greek yogurt that I was actually there to get. I have had goat cheese throughout my life on pizzas (not bad), in salad, and in cheesecake. Goat cheese has a strong musk(? )/flavor to it, and I have an unrefined pallate who barely is learning to appreciate wine and cannot stand olives or stinky cheese or other delicacies that people enjoy. But goat cheese is more friendly toward the lactose-intolerant, so in my effort to be open-minded, I decided to try it. So bracing myself for "that taste" in the yogurt, I got a strawberry-flavored one. I definitely tasted the strawberry, and yes, that goat cheese taste was definitely in there, albeit weaker than in anything I've ever tried. I don't think I will purchase this again... until I grow up, perhaps. 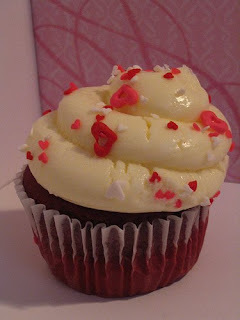 Hello readers of my sister's blog. I noticed that my sister got some new kicks lately but I didn't realized that it was time for me to also get a new pair until my legs started to hurt after my runs lately. I only hope it is because I needed new shoes and not something more serious. As much as I love shopping for running/workout wear, I simply hate shopping for running shoes. I wish running shoes would last forever. That's how much I hate shopping for them. But at last, I did go shopping. I was only suppose to pick up a new pair of running shoes as I think my current pair are spent. So I mosied into RoadRunners on my lunch break to pick up my old standby...my Adidas Supernova. I like it because it is hot pink. No that's not why. Maybe. Anyways, I found out that they were discontinuing that shoe. They still had one pair left in my size. I am a lucky person. 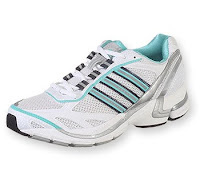 However, the sales person pointed out that my current shoe model is being replaced by the Adidas Supernova Sequence 2. So I tried them both on. No it was not because it was new. Ok maybe. Well I hate to admit this but even though that last pair of the Adidas Supernova were on sale and I've been using it for the last 2 years, I actually liked the way the new Sequence felt on my feet. I don't mean to sound like a shoe snob or anything but that shoe made my feet feel like they were bundled up with warm soft blankies. I noticed that the Supernova I am use to felt rigid compared to the Sequence 2. Sales person pointed out that the Sequence 2 is more flexible in the sole. So I caved, shelled out more money and got the Sequence 2. I have no regrets. They fit great and my feet immediate felt more supported. I cannot wait to take them out for a spin. 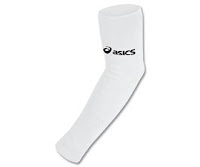 I somehow managed to spend more money and picked up some Body Glide and some Asics armwarmer in white. I will review those after I try them out soon...the armwarmers..not the Body Glide as I already reviewed that. This time around, I am going to keep a more accurate count of miles logged by my new pair of running shoes so I know exactly when I need to get a new pair. How do people know when they need a new pair? Do they just "feel" it, do they have leg/feet pain or do they keep a log? I am so interested to know. Seeing how I don't want to dish out money to get an iPhone (mostly just the phone plan that prerequisites it), my jealousy continues to grow as I think about my "Sister K's" iPod Touch. She showed me the Nike+ "app" on there, and I saw that you could log workouts on there. And now that I'm in the process of joining a consulting firm as a marketing intern, I need to use/learn stuff like Twitter (see my failing widget on the right sidebar). 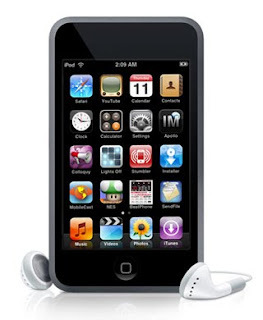 There is no official word from Apple when it comes to a third-generation iPod Touch being released soon (pictured is the second gen), but I am hoping it really does come out soon, because I think I am about to drop some money on it. But all the fun I could have playing on my phone while waiting... for class, during work... oh, the possibilities! Maybe it would fare better than my old-school calendar/day planner, which I should be using to log workouts and such, but that isn't going so well. 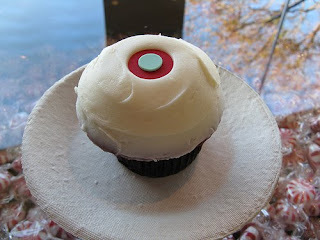 Speaking of wish items, I can't wait until the weekend. Today is technically my last day at work this week, as tomorrow I will be taking care of things that need to be unpleasantly taken care of. The man will be back from vacation this weekend, so perhaps that will end (or possibly exacerbate... there's no telling with me) my endless crankiness. The first couple of days that he was gone were tough, but then I realized that life goes on as usual and that there is plenty of stuff to do in it! So I started seeking a surrogate... just kidding. Miss you! Below: Look what appeared in my Inbox, one of the ones I've been getting to show (at least I think) that I have not been that much forgotten. 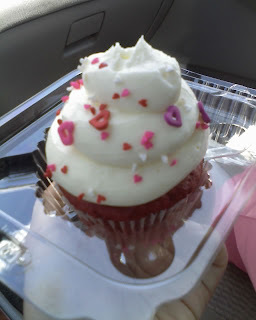 Very sweet pic was attached (but not shown for privacy reasons). I gave in to another fad. 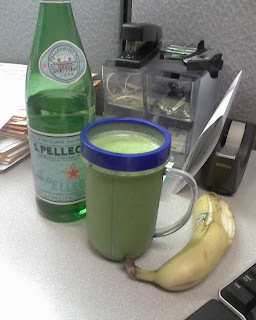 My latest convergence is this Green Monster drink. Being a not-so-great vegetarian that I am, I sometimes go through days without any veggies (subsisting on fruit and bread). 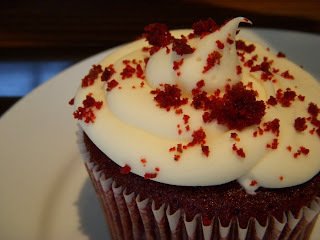 It's not that I don't like salad... but sometimes my moods get me wanting sweet things, and things that don't crunch. Additionally, I am such a huge smoothie junkie, and any chance I get at having smoothies that don't contain frozen yogurt or artificial powders... I take! Shortly thereafter, in spite of my skepticism of the drink blending properly, a beautiful green drink emerged (green is my favorite color)! It tasted light and not like spinach at all, with just the right amount of sweetness. I felt very good to be getting some veggies for breakfast! I prefer thicker drinks, so maybe next time I will add some frozen berries for variation, and maybe freeze the banana for more thickness. 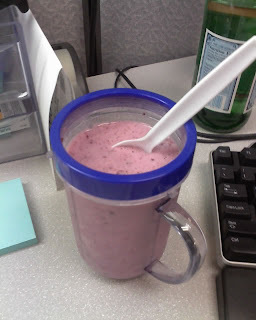 The day before, I had made a frozen berry version and thought it was comprable to Jamba Juice (my fave). 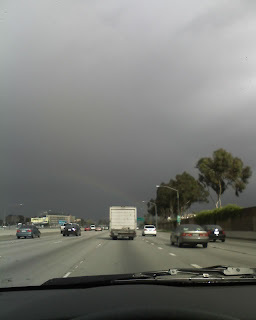 Above: A rainbow (faintly) appearing in early February driving on the I10-E freeway. 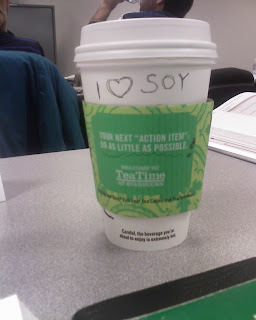 Above: The next day, I had a soy tea latte from Starbucks and made marks on my cup (if you read it, "Tea Time" appears on there. Above: An afghan throw I knitted for "The Ukrainian" this past Christmas. I believe I took this picture as we were about to head out to Mammoth this past January. 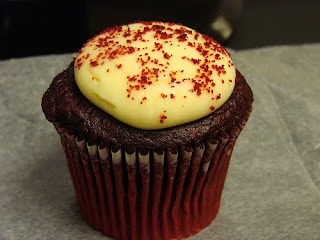 Above: This is my non-stock-photo of one of the cupcakes mentioned in my previous entry (Wonderland Bakery). I was a bit bummed that the top squished a bit. On a personal note, it's going to be a long week. This entry is completely non-running related. In fact, it is detrimental to the fact. Given that my most recent pair of running shoes have made it over a year with me, it was time for the next annual purchase of these necessary pieces of running gear. 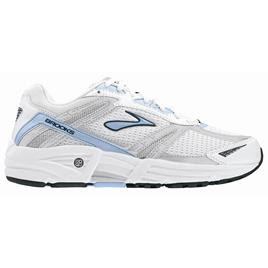 I never thought I'd be running in Brooks, since I did not think they made them for my wide feet. I was a bit PO-ed (i.e., unhappy) when I walked into A Snail's Pace this weekend and found the salespeople to be unattentive. One was with a customer, completely oblivious to the fact that I was, for many minutes, intently browsing the shoes, picking them up, flexing them, wondering why the selection had decreased since I was last there. Another was playing on the treadmill that they use for shoe-testing. Sorry to bag, but this is my blog, and one should be liable that bad word-of-blog/mouth will spread if you don't service your customers. Anyway, I left, vowing to just get my next pair of shoes online, chancing the last of the three models they recommended me two years ago that I have not yet tried. Instead, I ended up going to The Running Lab in the city of Orange. For $20 (a fee which is waved if you buy their shoes), they assessed my gait by watching me walk, do funny one-legged squat-ish things, took my foot imprint, measured my feet, and stretched me out on a table. In conclusion, they recommended that I wear a beefed-up insole in my left shoe due to one leg being longer than the other (slightly). They said that this might have caused my hip pain. They (or should I say, he=Anthony... thanks!) also concluded that I need a high-control shoe, and that the previous recommendations of shoes I have had at the other place were both too small and only had mechanisms for moderate control. No wonder I haven't yet found a shoe that I've really liked, I guess. So I walked out with this pair of shoes for $100, plus more for the insole. I think these look like basketball shoes, but oh well. I am glad that I finally tried out another running store, as the guys in here were attentive (even though there were other customers around) and even got a second opinion when it came to my leg unevenness. I also learned that I have been tying my shoes too loosely at the heel and that I should not just stuff my foot in my shoe when I put them on and should retie each time. That (and the shoes in general) will take some getting used to, but better to try something new than to be dissatisfied and injured all the time. Finally, I learned that unless you have very high arches, your foot arch (or lack thereof, in my case), doesn't affect the choice of running shoe, and in turn, running. Hope these shoes help me get over my injury and running funk. Meanwhile, I need to get some dirt on 'em, because too-clean shoes always look weird to me! Did anyone ever read those Louis Sachar books about Wayside School (if you haven't, they are lovely, fun kids' books!)? Well, this entry isn't about that. It's about something falling to the wayside... mainly running. The gym at my work has been closing early for the majority of the week, and as a result, the extent of this week's exercise was two outdoor 6-mi run/walk excursions and one ab session (does scrubbing down my car count as exercise, too?). I'm going to San Diego today with "Ukrainian" in tow and will at least be hiking tomorrow with one of my high school gal pals. But the thought of running again seems daunting. I start running and then feel slight twinges in my hip, and I just have no motivation to plow through when I get even a little tired. I'm hoping this will improve when I just go back to the treadmill, but we'll see next week. I am well into the 18-week training period for my next marathon. Starting Monday, I am going to TRYYYYYY to get onto a half-marathon training program (starting somewhere before the mid-point) for my half in October. I haven't been on a formal training program in forever and don't know how this is going to add to the stresses of life. In these next few months, that man of mine and I will be separated frequently for his travels (one week per month). This is obviously a blow to me, since he is the only one who will accomodate my schedule that otherwise leaves me very lonely. 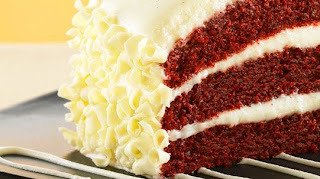 So I'm going to have to man-up and spend that time being productive (studying, researching), but a part of me is bitter that I am doing boring stuff in his absense. I might guzzle money by getting a massage, makeup, clothes, or something -- spend some "me-time" that hopefully doesn't end in weight-gain. I'll be off of work in less than 2 hours. Yaaaayyyy weekend! Here I am, alive and kicking at a barbecue I went to recently. Gotta love those veggies! 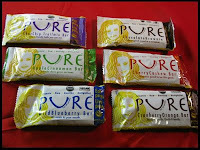 PURE Bars can best be described as moist, like LaraBars. They are a bit flatter the thus wider and a little less dense. As you can see on the right, they come in several different flavors. I tried the blueberry one. Blueberry is sometimes overly sweet in a bar, but this bar's representation was actually quite subtle. The chewiness of the bar was also very satisfying. These vegan bars have around 250 calories and can be found in health stores such as Trader Joe's.